How Urbandhobi is spinning the right business model in the online laundry space? Founded in June 2015 with a seed capital of INR 10 lakh, Urban Dhobi is a Jaipur-based online aggregator for Laundromats and is currently catering to six areas in the city. In just three months, the startup has acquired 2,000 users, of which more than 700 are customers. In August 2015, the startup was incubated by Startup Oasis, a Jaipur-based incubation centre set up at the joint initiative of RIICO, Rajasthan’s premiere industrial promotion organization, and the Centre for Innovation, Incubation and Entrepreneurship at IIM-Ahmedabad. Why we chose Urbandhobi as Startup of the Week? It works on Android app, iPhone app and a delivery app which enable users to track their laundry. Express service in which they deliver clothes in just four hours as well. Eighty per cent of clothes which are taken out of the dryer are wrinkle-free and don’t require ironing. But as per the demand of the customer, they iron out the clothes in Laundromat. It offers laundry at very affordable rates. Customers’ can pay for the service by cash or by card. Over 1,084 Facebook likes grabbed organically within a year. [su_box title=”More Startup of the Week From DSIM” box_color=”#c7c7c7″ title_color=”#000000″ radius=”5″]1) How Cityfurnish is trying to revolutionize the furniture rental industry? 2) How FreshMenu marked its presence in online food ordering marketplace? Urban Dhobi is the brainchild of four friends – Satyam Mishra, Prakhar Pagaria, Tushar Thettayil and Saransh Sidhu – who decided to leave their jobs in June 2015 to work on a prototype. Before starting Urban Dhobi, Prakhar, Satyam and Tushar were working for an international consulting firm based in Ahmedabad and Saransh was working for analytics startup Binary Labs in Delhi. Laundry is such an essential service of the urban daily life. Local vendors operate according to their convenience, and not according to the needs of the customer. 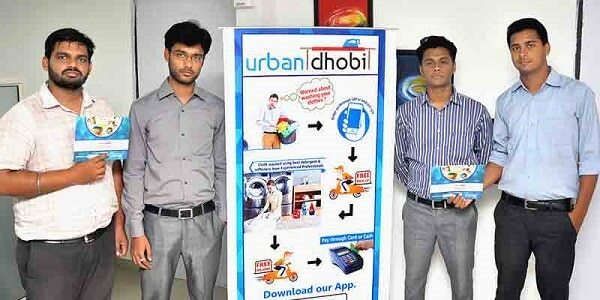 They recognized a huge potential in starting up a customer-friendly laundry delivery service and Urbandhobi was born. 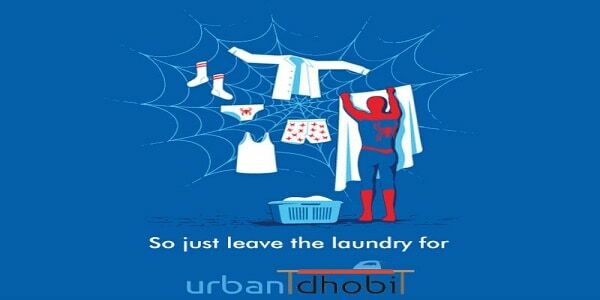 Urban Dhobi works on a simple business model. It takes the online order from the customers of minimum 3Kg of clothes. Once the order is confirmed, the company collects the clothes from customers’ home and delivers it back after washing. The startup charges INR 150 for three kg of clothes and INR 200 for five kg of clothes, and INR 35 per kg for anything above that. The average ticket size is INR 300, of which 65 percent is paid to the Laundromat. Urban Dhobi Pvt. Ltd. has acquired an undisclosed amount of seed funding from Delhi-based serial investors Vinod Bansal and Sanjeev Singhal. Also, the company is looking to raise pre-Series A funding by April end. With the raised amount, company plans to strengthen its team and expand its operations. Urban Dhobi will soon launch a monthly plan for customers that will allow users to recharge wallet with INR 900 and gain 1,000 points that can be used for five washes in a month. The startup also helps small entrepreneurs set up Laundromat in areas or cities where they are not available. So far, the startup has witnessed a growth of 20 percent month on month. It plans to receive 200 orders a day in the next one year and in terms of geographical expansion, will expand its services in Ahmedabad, Kota, Chandigarh, Indore, Pune and Hyderabad in the next six months. [su_box title=”More From DSIM” box_color=”#c7c7c7″ title_color=”#000000″ radius=”5″]1) CASE STUDY: How Mahindra & Mahindra accelerated its marketing strategy to be ahead from its competitors?